A unique multi-use building is coming to the corner of Clinton Place and Stockton Avenue, which is on the border of Downtown San Jose and The Alameda. 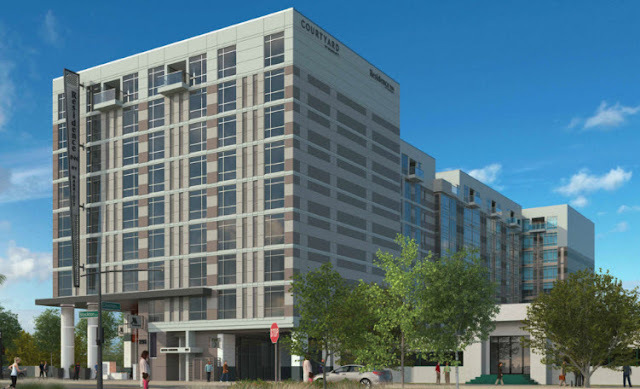 The nine-story (97-foot-tall) project would host two different hotel brands, a Courtyard by Marriott and a Residence Inn. Combined they would have 311 hotel rooms and three stories of underground parking. What is even more interesting than two hotel brands in a single building, is the fact that they are also building 19 market-rate condos on the top floor. This is the first time in Silicon Valley proper that condos are being included as part of a hotel project. Yet even more unusual, these are entry-level hotel brands. Typically you find condos that share hotel facilities in hotels like the Four Seasons, St. Regis, or Ritz Carlton. This goes to show how in-demand housing is in the area. The hotels and condos are an easy walk to Whole Foods, the SAP Center, and Diridon. When Google builds their headquarters Downtown, these will be the closest rooms to their offices. It's a safe bet that nightly rates will be astronomical throughout the workweek. If final approval from the city is received within 10 months, the hotels could be ready by 2020. 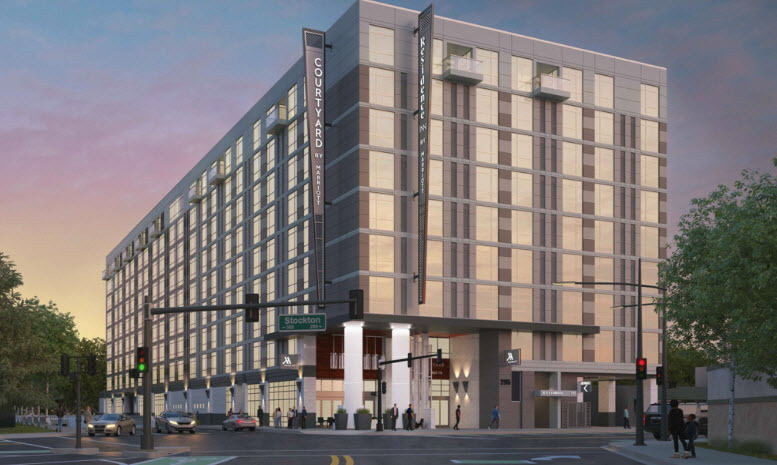 I'm happy to see more hotel rooms proposed for the area, but the building aesthetics could use some work. We don't want another AC Hotel fiasco (this kind of looks like a prison as well). Each new project should bring additional character to San Jose, and this looks quite generic. At minimum, perhaps they could utilize the giant roof area to build a park/outdoor lounge for guests and residents. The Pierce is a great example of how you can build something without height that is visually appealing and is additive to the neighborhood. I can't tell you how badly we need these hotels. I book room for traveling artists at Art Boutiki and paying nearly $400 per night on a weeknight means we have to pass on most of the really good stuff we are being offered, or charge a premium on the ticket.